I just want to let you know that I received my vehicle safe, sound and perfect in line with my expectation. Thanks to every one who made it possible. Cheers! I am glad to write back to you after I received the vehicle. The Ipsum is very good,just like you advertised. I was impressed that yours is not just business talk, BUT real talk Please keep it up. [...] I like your business attitude and execution. Thank you very much for the Pajero io. I received the vehicle two weeks ago and it's exactly as it appeared on the web and in an immaculate condition. Please be aware that I will be buying from you soon as I am a regular visitor to your site. This is to acknowledge that the vehicle we bought from your company arrived last monthly safely. It is a very nice car. Frankly speaking, it is more beautiful and in excellent condition than we expected. My personal experience with you and the impression we have is that you are really the giants and you beat the rest, no one can dispute that.We are enjoying its ride and we hope it will take us many years using it. Thank you for your understanding, we appreciate. definitely not hesitate to recommend your company to my friends. Thank you very much for all your efforts for making this transaction successful. Am pleased to inform you that I received the Camry (S/N 121013). It is perfect, thank you very much. I will call again. I'm taking this opportunity to thank you and the entire team of Trust company Limited for the job you have done to me. I have not been able to find the right words of appreciation and thanking you. I'm proud I received my vehicle in a good condition and I thank you very much. I'm planning to make another purchase from TCL in the near future. THANK YOU VERY MUCH AND BE BLESSED. Again I want to thank you for doing business and I hope we will continue this business relations. I would like to take this opportunity to thank all staff of Trust Company Ltd who assisted right from the start to the end in acquiring Toyota Corolla 2003 which arrived Dar Es Salaam as scheduled. I must say I was quite impressed with the condition of the vehicle from interior to exterior. Thank you very much, and I look forward to doing more business with you in future as well as recommending anyone interested in purchasing a vehicle through your company. know when I will be buying my next car and also I have already started telling my friends what a wonderful service you offered me. I would like to acknowledge receipt of the vehicle Toyota Vitz I purchased from your company. The vehicle arrived safely and in a very good condition. I would like to appreciate for the best quality services you rendered to me. I am very grateful to have that car. At first, after jumping into the car it seemed as if I was dreaming as it is the first time to have my own car. I am very very proud of it and I am proud of you all for the best services and may the lord almighty be with you all and continue to be such. My vehicle arrived exactly on the said date 10th April, 2011. I would like to acknowledge receipt of my motor vehicle I purchased from your company, Trust Company Ltd. Everything is OK and I am very happy with the way I have been assisted by you and your company. You are indeed a trusted company. am happy with the unit. I was initially worried when the tsunami and earthquake hit japan but you advised that your operations were not affected. I wish to commend the Trust Company. This is Eric K. from Burundi, I just want to inform and thank you for the car I bought from Trust Co., the car Toyota Corolla II is a very good condition car as I requested it and the mileage was as per I bought it, so thank you for everything and let keep it touch, really your company is a trustful company and I can advise every one to buy from you.see later I'm planning to buy some other car left hand to take to Rwanda. Am very happy to inform you that I have finally received the vehicle, your products as trust company are very good, neat. I will definitely be one of these advertising your coy. You have got good products. I always find joy to write to you when ever I intend to buy and receive a car. My family and I we were extremely happy when we receive our Mark11, one of the many nice cars we have bought from TRUST through you. My wife was so happy because the car came very clean and very good performance as you will see on the attached photos as she poses on the car and myself with a kid. TRUST is our house hold name. Thank you very much I received my Toyota Spacio in good condition. 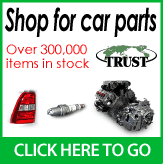 TRUST Company Ltd is a trusted business partner! I am proud to drive my new Toyota Spacio. Thanks. Thanks very much for your business. I am very thankful for the Toyota Vitz that has just arrived, I am very much in love with it. It arrived in a good condition and i have just done my first service. Its very stable on the road and its very comfortable inside and more spacious. My daughter is enjoying it ans she wants to go with me everywhere I go. Once again, thank you very much for the good business. Recently I have introduced a friend to purchase a vehicle from you. You never disappoint customers because your customers receive what they ordered. [...] I'm very Happy with the car and sun I will contact you to buy another one.